Weeding small letters is difficult. As we all know, weeding is the term we use to describe the process of removing the vinyl we don’t want to use. But when you cut out vinyl, weeding has to be done. You might try any of the following tips to make weeding small letters easier. When laying the unweeded vinyl on the table, right reading, start weeding from the upper right to the lower left. If you have letters that are 1/2′ or smaller try taping out the entire area cut. The letters you need will come up with the vinyl all in one piece. Lay it on the weeding area with the sticky side up and use spring clamps to hold the vinyl down. This makes it so you can weed away the excess without losing the proper alignment of the vinyl. Another method you can try is to cut only a weeding border and no weeding lines, except those needed to separate the letter groupings. Next, weed out the centers of letters such as the holes in A, E, and O – do not weed the rest. 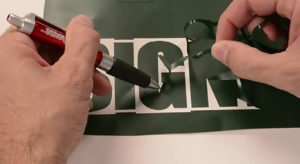 Then, cover the lettering in transfer tape like you normally would, remove the backing paper and apply as usual. From there you should be able to remove the transfer tape and waste vinyl without running the risk of losing letters. A fourth tip for weeding small letters is to put the vinyl in the freezer after you have cut the vinyl. Leave it in there for about an hour, or until the vinyl shrinks. This will help save time and make the weeding process of small letters easier. Try these tips next time when you have to weed small letters.